Here’s the latest news update (APRIL 2019). CitadelSix Custom Design under new ownership! If you wish to receive e-mail alerts and News Bulletins about new products and release, please send an e-mail to the contact address here. The GDPR came into force on May 25, 2018, Therefore, in compliance with this legislation, information pertaining to GPDR requirements can be found on the Legal Stuff page. On Monday, 1st April 2019, Sue Crick, my niece, is taking over ownership of the business, so that it continues in the same vein and kept within the family. Sue is an enthusiastic modeller and gamer, and is really keen to be involved with the table-top gaming industry and society. She’s very much looking forward to maintaining a presence at events and shows, and to meeting other traders and customers. 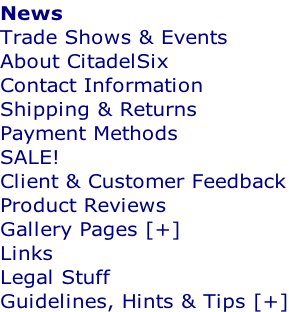 All that remains for me to say is that I’ve thoroughly enjoyed running CitadelSix Custom Design for the past 12 years, and although I’m handing over the reins to Sue, I shall be providing support for the website, and to Sue in a purely advisory capacity. I’ll also still be coming along to shows and events. So, I’d like to say a huge THANKS to you all for your custom over the years, and WELCOME Sue! As noted above, VAT will no longer be charged on any of the products. This change is due to several reasons, but mainly to make the accounting side of the business simpler for Sue.